Congratulations to our Top Posters for the following months! TOP POSTER OF THE YEAR 2014: 2bullymama! Cool, congrats to the winners. 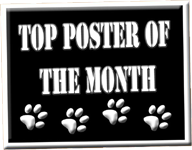 Happy to be Top Poster for Feb. 2015 woo hoo!!!! !